Is Dressing Up In Bale's Batman Cycle Armor Just Asking To Be Sideswiped? Wasn't this exactly what Bruce Wayne didn't want? A bunch of fake Batmen running around getting themselves into trouble? 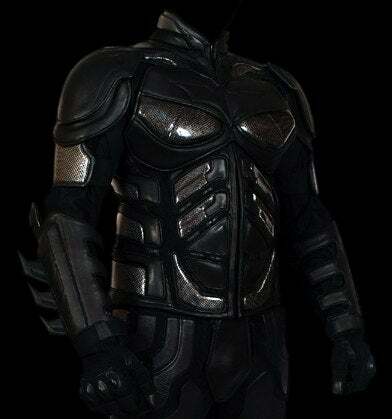 And yet "official" Dark Knight motorcycle armor is being released — forearm fins and all. No word just yet on the price, but I'm estimating it will cost one adult human's dignity. While the armor is ridiculous and looked hot on Bale (strange stomach-muscle ridges aside) I'm pretty sure nobody else could pull off this look, let alone on a motorcycle. But if you can afford it — and I'm sure it's coming with a hefty price tag — more power to you. An Officially Licensed Replica Like No Other is Coming. - Form Molded Leather and Kevlar Armor Sectons.